Tile-laying games can be kinda hit-or-miss for me. I've never really enjoyed the very well-received and endlessly expanded-upon game Carcassonne as I found the aggravation of utterly random tile draws totally outweighed the enjoyment of seeing the land take shape. And yet I've recently fallen back in love with the nastily strategic and abstract Tantrix which could also fairly be accused of being a bit too random. Maybe the difference in Carc is that you always are looking for that certain one tile to complete your scoring and you just never draw it. Whereas in a game like Tantrix (or even Ingenious, for that matter) you try and make do with what you have and usually a clever move exists. San Francisco Cable Car (a reprint of the older Dirk Henn title Metro) is an excellent little board game that seems to fall somewhere right in between. The choice of what tile you play each turn is quite limited but exactly where you play that tile can make all the difference. The gameplay of the basic game (which is exactly the same as Metro) is quite simple and, as in most Queen games, very clearly explained. Each player has the same number of cars in their colour which are placed on designated spaces around the outside of the board. Players take turns either playing their hidden tile onto the board or draw a random tile and play that one instead. Tiles must obey a few rules: all tiles must be oriented in the same direction, they must be connected to the outside of the board or another tile, and if at all possible they must not cause a car to score only a single point. If after the tile is played any player's car is connected in a continuous line of track to a station, then that player's car scores a point for every tile its track runs through. If that station happens to be the power station in the centre, then the points are doubled. So in the basic version, players add tiles trying to extend the tracks of their own cars while running all of their opponent's cars into stations as fast as possible. It's pretty nasty stuff but a fairly short game so players don't tend to get too upset. Now, the big difference between Cable Car and its predecessor Metro is the new stock variant which in my mind takes a very light game and makes it much, MUCH more interesting. 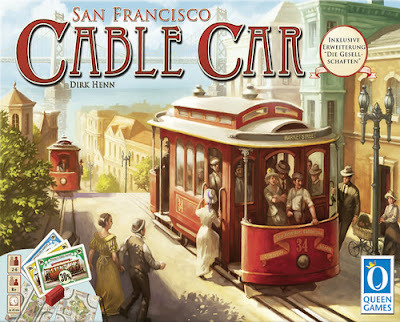 It is also, I think, what makes Cable Car so worth the purchase. In the stock variant none of the coloured cars are owned by the players. There are now 8 companies with 4 cars each and each player is given a random set of 4 stocks in values of 10, 20, 30, and 40 percent. In addition to a regular play of a tile, on your turn you can instead exchange one of your stocks with one of equivalent value from the face-up stock or random from the top of the pile. This stock exchange is available only until one company manages to score 25 or more points and then all players' stocks are locked in till the end of the game. Once the final tile is played and all the cars have scored, players stocks are valued according to their percentage times the relative rank of the company. (For example, if the black company placed first out of the 8 companies and I had a 30 percent share, it would be worth 3x8=24 points.) In addition, there are some small company bonuses for players with majorities. Once the tally is done, high score wins. So the stock rules don't add too much complexity to the game but they allow for players to focus on increasing the length of paths for multiple companies. They also shelter players a bit from being directly attacked although it's almost guaranteed that early on someone will make your 60 percent share company score a 2-point car. But at the point you just exchange your 40 percent share for one from a different and hopefully better company. Of course, this can only occur before one company scores big and then everyone's assets are locked in. And this adds a delicious tension and makes the speculation that much tougher as not only can exchanges only be done early on but you must also give up an opportunity to add track to the board. And since only 60 tiles can ever get played in a game, your options to influence the tracks are already fairly limited. Eric, we played Mammut the other night (4P). I really liked it, I think the others did, too, but they're going to give me their opinions later. I'm pretty happy with it. But this game, more than most, has a huge gap between the learning portion and the strategizing porition. What I mean by that is the rules are simple enough, but everything we did on turn one was completely random because we didn't know what we were doing. We knew how to play but we sort of did whatever to push the game along. After the first scoring then the fun kicked in. Some games require you to use the first session as a writeoff to learn the whole thing. This one needed the first round only. That's a plus. We had a situation where two of us possessed the same animal and when he stole from me and threw that animal back into the centre, I then did the same thing to him. We realized we could have been put into a continuous loop. This could use some sort of rule to prevent this. Bottom line: I really like Mammut and I only hope it's got longevity to stay in my collection because it's an expensive game. We also played 1812 last night - that is a fun game. I really like partnership games. Re-read the rules and get back to me as I think you guys may have misunderstood something. But I'm glad you enjoyed it! It's pretty nasty stuff. Also, you never draw more tiles if you already have your share. You just sit and wait for the others to finish or your share to be stolen. Thanks. I think we played it correctly, but our perceived loop wasn't from actual play. Thank you for the clarification.